Gripe water is a liquid given to infants with colic, gastrointestinal discomfort, teething pain, reflux and other stomach ailments. Dabur Gripe Water contains ingredients like Sarjikakshara and Mishreya tail, which helps to sooth stomach ache, guards your baby against common intestinal ailments like gas, indigestion and acidity. Its regular usage also helps to reduce teething troubles. It is a safe and effective remedy for your baby that makes sure that your little bundle of joy is all happy and healthy. Ideal for children aged between 0-2 years, Dabur Gripe Water solves all the common problems that your baby may have during that tender age. It neutralizes excessive acidity in baby’s stomach, helps to break down trapped gases, eases abdominal pain and cures indigestion. Dabur Gripe water is a naturopathic option and is highly recommended by paediatricians and alternative practitioners. Traditionally gripe water was made with dill, baking soda, and alcohol. 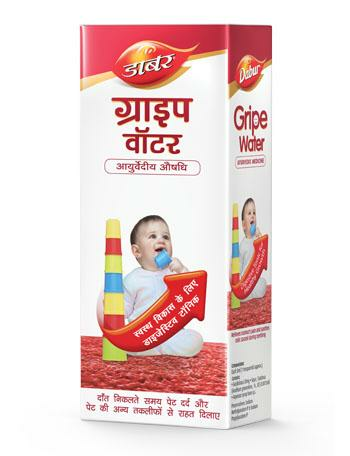 Dabur Gripe Water however is a modern day version and does not include alcohol. It is made of natural herbs that help to settle your baby’s stomach and relaxes his cramping muscles.